Three years ago I had the opportunity to get to know a veteran band, called SBS (Spicy Bits Of Scandal), which I have never heard about, meaning that prior to my first encounter with their material, absolutely nothing came to my mind. Maybe due to the fact that the first period of their existence until the 90s was rather bleak under the communist rule in Lithuania, their country of origin, producing only a single demo in 1988, but I can't be certain as after the fall of the Iron Curtain, the band released three albums between 1996 and 2007, all delivered in Lithuanian and released independently with a private distribution. 2009 signified a changing / turning point for the band with the release of their first album in English, fourth in number, named "The Gambler". It was an important step in the band's career to reach out to more listeners. I had the pleasure on reviewing it for Metal Express Radio and I was highly intrigued with what I listened to. Heavy Metal has been boasting with many faces but for the formation of something that will resemble a sort of Metal opera or a theatrical effort, a band will need to amass lots of talent for the hard undertaking other than the mere simple things. I didn't find it to be a concept release, but it sure introduced me to a unique form of classic oriented Metal music, not too powerful yet clearly not caressing either. Four years later, I received word that the band will be releasing its fifth release, "Heaven Can Wait", still independent but with a label, Defox / Heart Of Steel Records, to launch the release via digital stores. I told myself that I had to cover it; something told me that I would like this one as well. In general, "Heaven Can Wait" is the continuance of the same ideas that I first encountered with on "The Gambler". Just so you know that SBS aren’t your average type Heavy Metal band as they share a variety of elements taken from Progressive Rock, Art Rock and 80s oriented Heavy Metal. There is a positive flow in their material; it has its own catchy lines, with elegant implementations of the assortment of genres infused together and a songwriting type that showed plenty of experience and maturity. There have been several junctures where I noticed a bit of SYMPHONY X, AVANTASIA, ROYAL HUNT and later KAMELOT, especially with the type of modern edge, heavy guitar riffing inspired by past examples, a pleasant soloing showcase, an impressive keyboards orchestrations made by the professional hands of Mistheria & Ferdy Doernberg (Serving as the album's guest artists), and a frequently tight rhythm section displaying more than the average structures. However, SBS's longstanding frontman, the band's perpetual spinal cord and nerve system, Don Vito, with his distinct voice pattern, and occasionally hefty Lithuanian accent, noted the difference in the band's musical viewpoint. It would perhaps take some time to adjust your ears to his style of singing, but in time it will be evident that his fermentation with the music is so soothing. "Religion Of Rock" decreed the band's chip of the old Metal / Hard Rock flame with a catchy, anthem like tune for the love of great Rock music, basic, simple riffing but quite a presentation on the chorus with multi vocal efforts. Something that overwhelmed me was the blunt usage of the main riff of DEEP PURPLE's hit "Burn" on the intro and outro of the track. It was kind of weird and I hope that SBS played it as a tribute to one Rock's greatest bands. "Bloody Wedding", a darkened mysterious track, kind of in the spirit of most SBS songs throughout the album. I enjoyed the main riff, along with the verse riffing that follows that seemed rather intense, Don Vito's singing is excellent displaying varied layers of his vocals. "Puer Malus – You Are The Witch", played out to be an adequate blend of 80s Heavy Metal along with late 70s Hard Rock, mystifying work on the keyboards, several tuneful harmonies and an explosive chorus preaching witchcraft. "House Of The Evil", a straight up Hard Rocker with a tight rhythm section, quite ACCEPTish in direction, very simple to comprehend with one-dimensional riffing with an impressive soloing. "Danse Macabre", plashed with a darkened atmosphere, constructive, well arranged and somewhat an emotional feature in the manner of KAMELOT and EVERGREY without leaving any doubt that SBS enjoy the unknown, seeking for new ambiguities to dwell on. "Fallen Angel", a wicked speedster with an attractive main riff, easy to interact, hard hitting that most of what the band displayed, more of the Euro Power Metal nature, catchy and adequate. "Don’t Torture Me", considered as the album's bonus song, a fine potential hit that should have been one of the official tracklist, structured and feels like an 80s AOR, Hard Rock number, nice riffing, cool chorus and great keyboards work. I believe that "Heaven Can Wait" has more than enough moments to prove that SBS has a multi personality disorder, in a good way of course. Their material was well produced, reaching a high potential of unison between Rock and Metal. 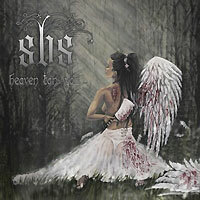 SBS is a band to be known and check out, I recommend just that.